How can you provide a bilingual learning experience that includes high levels of achievement for both English-language learners and English-dominant students? What can you do to include all students in the adventure of learning a new language? Two-way bilingual education helps children maintain their cultural language as well as learn a new language—an invaluable skill in an increasingly integrated world. 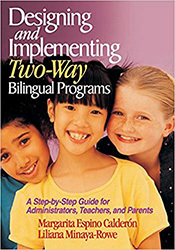 Designing and Implementing Two-Way Bilingual Programs provides essential elements to help your students gain literacy in two languages, increase cross-cultural understanding, and meet high levels of achievement in all core academic areas. This indispensable handbook also includes strategies for building learning communities for dual-language teachers, professional development plans that meet the specific needs of dual-language programs, and tips for involving parents. Liliana Minaya-Rowe is bilingual training coordinator at the Hartford Public Schools, where she works in professional development plans and practices for two-way immersion, bilingual, and ESL programs; effective first and second language instruction; teachers’ learning communities; and parent/family involvement practices. Minaya-Rowe is also professor emeritus of the Neag School of Education at the University of Connecticut. Her research interests, publications, and teaching include teacher education, literacy, bilingual program development and implementation, and discourse analysis of bilinguals. She holds a master’s degree in Applied Linguistics and a Ph.D. in Education. Minaya-Rowe’s 80+ publications include journal articles, books, chapters, teacher’s manuals, and guidebooks.